One sentence, from a 2014 review of Barbara Stanwyck: The Miracle Woman, published in The Wall Street Journal almost exactly three years ago, resulted in a westward journey: “When she died in 1990, she asked that her ashes be scattered over Lone Pine, Calif., because she had enjoyed making westerns there.” Population 2,000 (not counting visiting outdoorsmen and Western enthusiasts) and close to mountainous national parks, Lone Pine and its chamber of commerce website was thereby visited frequently by a laptop with an IP address located in Buffalo, New York. Long a fan of Westerns and their stylized opening panoramas (deserts, mountains ranges, passes, trails), renderings of two-dimensional burgeoning towns, and the archetypal people populating these outposts, I wanted to see the place where hundreds of them were shot. Knowing that Stanwyck, born in Brooklyn and of immense talent and wit, thought enough of Lone Pine to will that her remains rest there created more intrigue. And then, in one of my deadline detours doing more Lone Pine research, I discovered that there was a burro rescue ranch in Olancha, California, approximately 25 miles away. Also a lifelong fan of these wee donkeys with distinctive rings around their eyes (and also stalwarts of Western movies), this discovery led to travel. Researching accommodations, I found a ranch with rental cabins in a micro-canyon at the base of some of the eastern Sierras, land with a small stream (Carroll Creek) once owned by one of the founders of Sierra Club. This ranch harvests, among other things, both British and French lavender: In spring volunteers work in exchange for food and lodging—it’s a desert kibbutz, I began to tell the same friends who would, on occasion, be texted found images of burros. In October 2014 I planned the first of (I’m certain/hoping) several journeys to Lone Pine that was finally realized this month with one of my nearest and dearest, Heather Sacks, a talented veterinarian. We did not anticipate the intensity of this winter on the East Coast when planning, but our flight (lucky JetBlue 777) made it out of Boston on February 15 when Logan International Airport was open for approximately two hours. We would share this fact with the state trooper who pulled us over for speeding in a tired rental Corolla in Death Valley. He was taken by our tale of 777, burros, and blizzards, and let us go on so that we could arrive at De La Cour Ranch in Lone Pine by nightfall. “Well, I won’t hold you up ladies any longer. Have a safe trip,” he said. 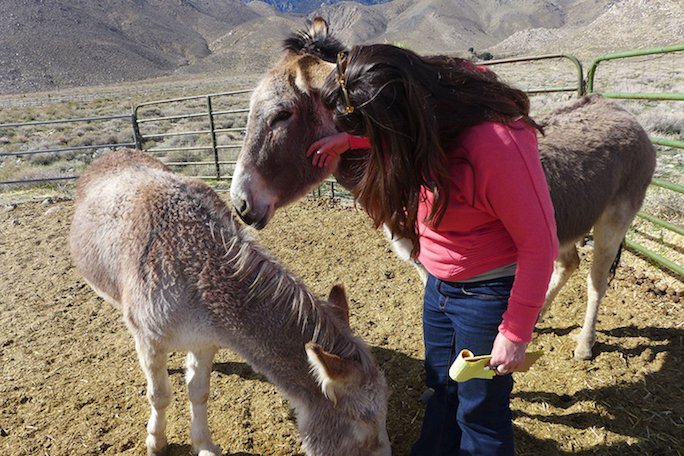 A long and dusty drive through the desert ended at the gates of Wild Burro Rescue and Preservation Project, founded by Diana Chontos in 1994. 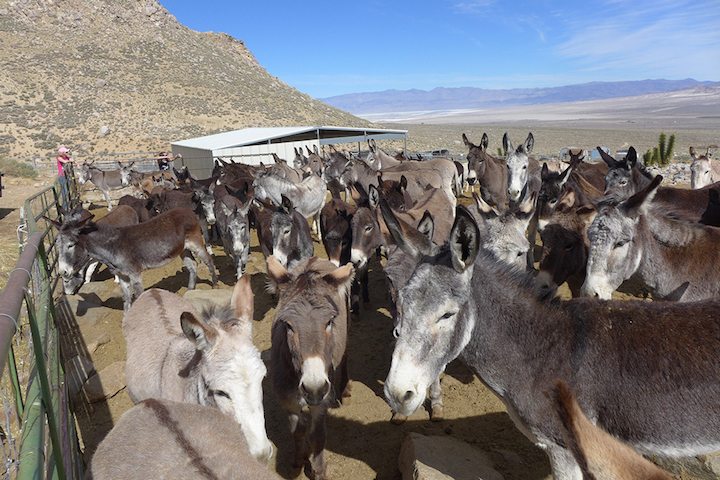 It’s a 130-acre sanctuary for 200 burros, a handful of horses and mules, a cow, and some dogs. Raised on a farm in the Northwest and a lifelong burro owner, Diana began doing rescue work when she heard that burros were being not only displaced but shot by Park Service and Bureau of Land Management despite a 1971 law passed by Congress mandating roaming land for them. In California cattle ranchers needing to lease more grazing land, and in other Western states those protecting bighorn sheep (also sometimes hunted by those with expensive, auctioned permits), has meant an unfortunate end for thousands of burros. And it’s true. 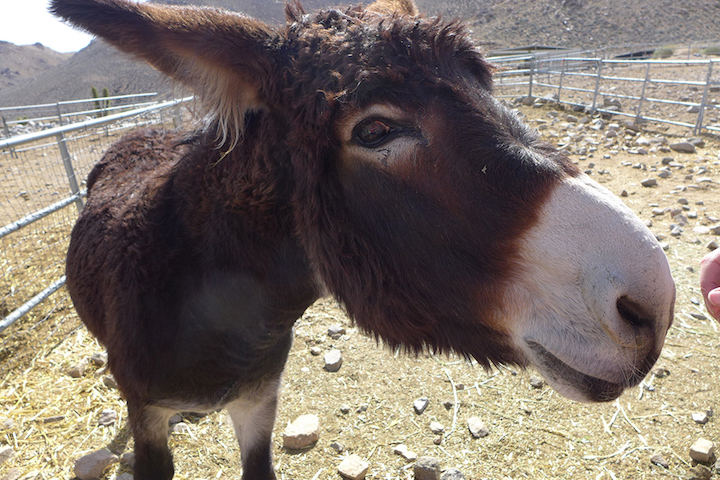 The burros pressed against me in greeting when I went into the center of a pen holding 80 rescued beasts. They waited patiently for head scratches and then peppermint-flavored treats that Victor, a ranch hand, gave me to give to them. Their back crosses (spanning from head to lower back and shoulder to shoulder), distinctive large ears, and eye rings were known to this writer. Their sweet temperaments were my treats. Since landing back East I’ve adopted a burro and have discussed with Diana helping her promoting the rescue operation. 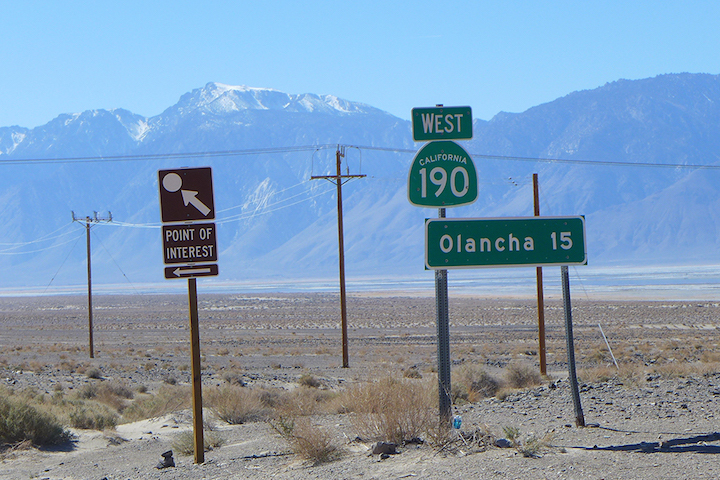 Everywhere we stopped in Lone Pine I told those wondering how two East Coast women landed in Lone Pine and Olancha that week, and then we toasted Barbara Stanwyck.